Was Bill Clinton’s Charlotte speech the best performance so far? Who Was Better—Bill Clinton or Michelle Obama? 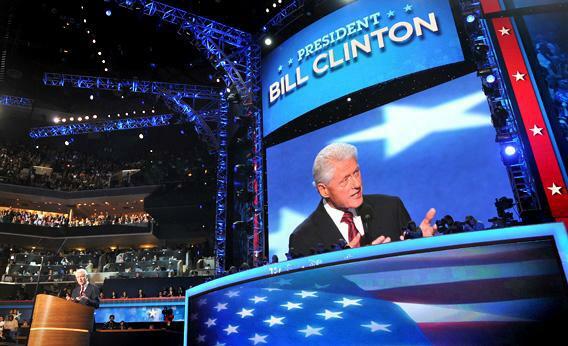 Bill Clinton addresses the audience at the Democratic National Convention in Charlotte, N.C., on Wednesday. Read the rest of Slate’s coverage of the Democratic National Convention. On Wednesday we hailed a radiant, genuine performance by Michelle Obama—one that inspired 49.4 percent of survey takers to join Team Barack. The first lady’s speech scored better than any speech we had heard from either convention. So our third question aimed to assess how she did against a certified master of the art. We asked: “First Lady Michelle Obama spoke on Tuesday night of the DNC. Former President Bill Clinton spoke on Wednesday night. Who do you believe delivered the better speech—Michelle Obama or Bill Clinton?” Here, the silver-tongued fella from Arkansas won the day, as 49.8 percent of survey takers chose his address over the first lady’s. Another 24.6 percent remained undecided, and 26 percent thought Michelle, the underdog, prevailed. But Thursday night is the main event. It will answer the question now looming over Charlotte: Is Obama as good at talking about his record as Bill Clinton?